I’ve been getting some inbound questions about fly fishing. It’s fun to get those and try to answer them. Many of the questions cover the same topics, and so, I thought I’d jot down some thoughts. You may find a lifelong activity you can do with friends and family. You’ll be immersed in nature, amidst some of the most beautiful and pastoral scenes you can ever imagine. You’ll find a certain Zen-like vibe to it all, as you ready gear, drive, rig a rod, cast, change flies, change techniques, watch birds circle, see bugs rise, study current seams and plan your next cast, hook and land fish, take a break and eat a sandwich, fish more, dis-assemble gear and drive home. You’ll run into some amazing folks on the river. They may not have gone to college or high school. Or, they may be famous CEOs. But, everyone is equal on a river, and 95% of the people angling are super-nice and want to help you. You’ll push yourself to be mindful and relaxed, yet at the same time, highly observant of all things around you. Was that a fish rising? Is a bug hatch about to start? Are there sub-surface currents killing your presentation? Did I just throw my shadow on the water? And, on and on and on. A day well-fished is truly a most satisfying moment in life. You can always ask a friend to take you out, but the anglers I know are obsessed about getting in their own fishing. So, I recommend you hire a guide. There is a very elongated learning curve. And, there’s some investment required, and so, before you buy gear, you first may want go out and see if you like it. I learned by making annual summer trips with a child or two to Pittsburg, NH, near Canada, where I stayed at Tall Timber lodge and hired a guide named Bill Bernhardt, who works at Lopstick. Once I learned a few basics, it was a joy and easy to go on my own. Then, we did a family vacation in Montana and I fished the Upper Madison River, one of the best trout waters in the world. I was sold. And, it all started with a kind, patient and knowledgeable guide. If you’re local to Boston, there are many good guides. They work local rivers. So, you can drive one hour and start fishing. I’d visit a local fly shop, like Concord Outfitters. Andy, Miles and Justin there are incredibly thoughtful and informed. I hear that making money at a fly shop is really tough and the people who run one are doing it for love of the sport. So, it’s good to support the stores. In addition, I’ve found that fly shops give great advice, and, if you visit them as a customer, they’re naturally more likely to do so. If you’re tight on funds, there certainly is a lot of good new and used stuff on eBay, and Fishwest is a mail order company with awesome customer service. There truly is a Pareto effect with flies. There are thousands of flies, but there are a few go-to ones that you can fish with confidence. The flies below mimic a bunch of creatures, and so, work well in nearly all situations. Moreover, note that trout pick prey based on the following criteria in rank order: size, silhouette (the shape of the fly), color. So, focus more on having a variety of sizes rather than a variety of sizes and a variety of colors. This approach greatly simplifies things. Dynamic Nymphing by George Daniel. This covers “Euro nymphing,” which is the best way to catch fish consistently IMO. I hear it is the most common method used at fly fishing competitions. For me, my fish-catching jumped tremendously since using the techniques, peaking one day when I landed 37 trout. Prospecting for Trout by Tom Rosenbauer. Full of tips and actionable insights. He also hosts podcasts via Orvis. I listen to them when I drive to and from the rivers. Gets me in the mood, and I learn a ton. Feeding Time by Jason Randall. Jim takes a look at the world from the trout’s point of view. He uses a lot of data to help anglers know why, when and on what trout feed. A great read. Hands down, the best book for Massachusetts rivers is an old book from Trout Unlimited. It has good stuff, including maps. You should visit the USGS site to get a sense for stream flows and what is fish-able at any given time. Trout behave differently if a river is running high or low. The site posts water temperatures, too, for some rivers, which is key during the summer and late fall, as trout really change their behavior when water is warm or cold. I have fished a few rivers locally: the Swift, Millers, Squannacook and Westfield rivers. Each is very different from the other. Ken Elmer’s blog profiles three of them. I’d love to try the Deerfield, North and Green rivers. There is so much water out there. I’d like to try the waters near Stowe, VT. One day, I’d love to go to New Zealand. Rod: I have five rods, but my go-to one is an 11-foot, 3-wt rod from Sage, and it is a specialty rod for Euro nymphing. I can also use it to fish dries, streamers and wets. The tip of the rod is super sensitive, which helps spot very gentle takes. New England waters are small, and so, I’ve found a more powerful rod to be over kill. Bag for 1/2-day fishing: Orvis sling pack. I can take everything with me, from flies, leaders, tippets, snacks. The pack has cool various pockets and straps. I also can attach a landing net to it. 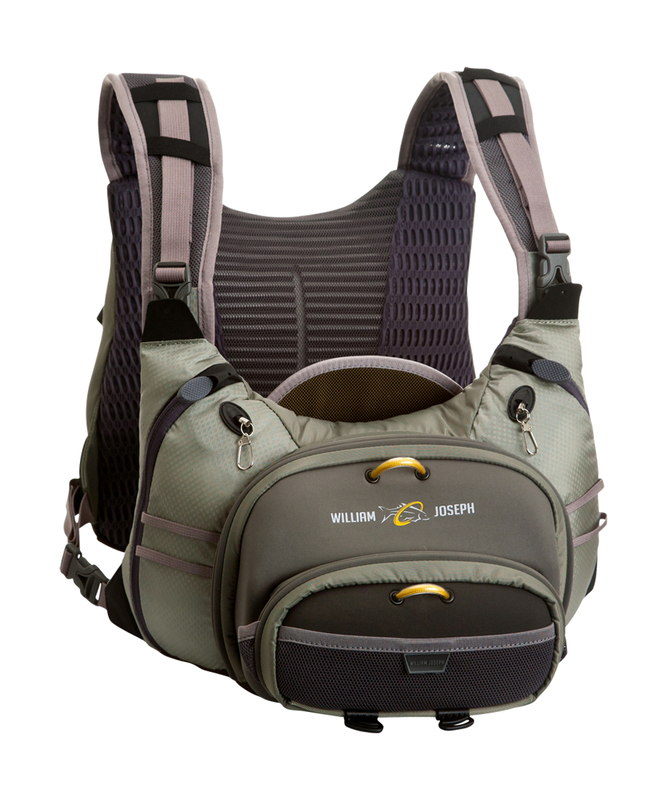 Bag for all-day fishing: I use the William Joseph Confluence chest pack. Can fit a lot of gear in it. I love the magnetized pouches: easy to open and close the pouches, and can stick your fly to it as you change rigs/flies. 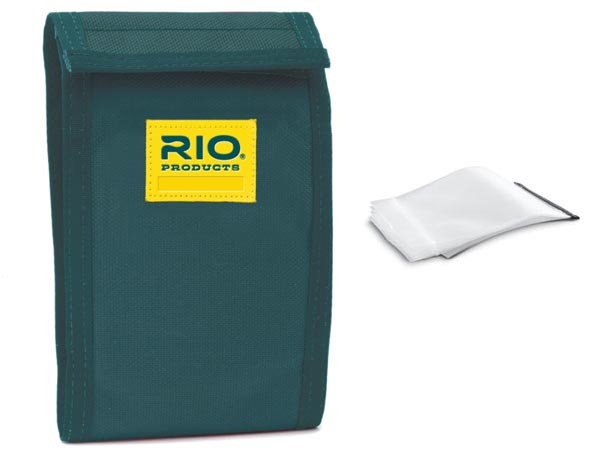 Leader storage: I use the Rio leader wallet. This is a great way to organize. I store in there various rigs which I’ve pre-tied, including some homemade leaders. Net: I use a rubber one. This is a great invention. The old-style nylon nets often get tangled with hooks and can dig into a fish’s gills. A rubber net solves all that. Waders: I use Orvis chest waders. I buy the cheapest ones I can with breathable nylon. Cabela’s has cheaper products, but I like how you can send to Orvis your waders if they have pinprick holes that leak and which you cannot find (and, waders always leak no matter what you buy). They charge only $40 for that service. Hook sharpener: critical. I often forget to use it, and when I don’t hook a fish, I remember. When I keep my hooks sharp, I hook many more fish. Water thermometer: trout are cold-blooded creatures, and so, are sensitive to water temps. The ideal temperature is between 50 and 55 degrees Fahrenheit. Above that range, the amount of oxygen in water decreases, which means trout in the heat of the summer will rest during the day and feed at dawn/dusk/night. Below that temperature range, trout metabolism slows down and they save energy by minimizing movement. They shut down. So, knowing a river’s temp is critical, and finding more oxygenated and/or cooler parts of the river in the summer (riffles, near springs or where a brook enters the river) and warmer water in winter (the shallows in mid-day) can make or break an outing. Fish stomach pump: not as horrific as it sounds. You can use one to see what fish are eating. That’s important because the bugs you see in the air may not be the ones the fish are targeting. You just want to avoid pumping small fish and you want to avoid all pumping during the winter, when food is scarce. So, hopefully, that will help you get started. Fly fishing is incredible. I’ll end by mentioning the video up top (or, click here). With the fishing season over, it’s fun to remember past outings. This one was on a very cold day, during which trout were catatonic and nearly invisible, but I managed to land a 15″ rainbow. As I was casting towards some structure, I saw a large shadow peek out from a log. If I stripped the streamer too slowly, the trout lost interest. If I did so too quickly, the trout gave up, not wanting to spend its precious energy. So, it was delicate dance, when, one time after ten casts, the trout gently decided to take the fly. Then, all hell broke loose. Priceless. Can’t wait for the spring.